World of the Fifth Sun: Aioskoru part 1 : "Wild Horses"
For many days they had traveled, having left the last of the human settlements far behind. Only green fields of grass and cloves alfalfa extended in all directions. Two brown cloaked figures walking in a sea of fields. Only an occasional grove of trees, normally along a stream headed down towards the real ocean, interrupted the expanse of green. Winter had receded and spring had brought forth abundant growth. The strong winds from the west (cm. ueos) kept blowing a constant but rather warm wind coming off of the Blood Sea (cm. Esnes Mori). A constant grey cloud filled sky brought showers throughout the day, Madi was constantly soaked. Finding dry wood for night fires was always a challenge. Andelin looked no drier. Widespread fear had spread across the lands that they left behind. Many were preparing their weapons of war, fencing defenses, and stocking ammunition to ward off the threat that had recently been attacking small outer villages of the Homeland (cm. Keios Lendh). "It's the scorpion people," he said pointing towards the far distant barren rugged hills and plateaus one evening as they were setting up their tents and preparing for camp. He, although young, seemed much older than her - or maybe she just was more vibrant. Madi and Andelin and been sent to seek help and the counsel to fend off the attacks. They sought help of the distant lord of the horses (cm. Reg-eqouinos Klopnis). Little was known of them - always distant. Only a few legends and tales were heard from those that encountered the majestic half human-like half horse-like beings. Days they had walked, not willing to chance being caught on horseback by horse guardians. What punishment would they demand were they caught for such actions - though horseback is common outside of this land? Horse totems had sporadically been placed along the lands. Seeing the rock image of a heroic figure swinging a very large sword-staff at what looked like demons etched into some of the basalt totems sent a shiver down her spine. Andelin was leading their walk this day. Slowly they were making their way up the gentle slope of one of the rolling hills. At the top he stopped and then went to a small crouch. He then did a quick hand motioning her up to him quickly. She increased her pace and crouched. The crest of the hill revealed a distant herd of horses. Then the more she looked, the more she realized that the horses had human-like torsos instead of heads. The sight stopped her breath momentarily. Although she knew that they were looking for the centaurs, actually seeing them in the flesh was much more marvelous. The colors of the torso blended in with the patterns of the lower horse torso. Some where brown and white. A few white. Some were all black. Madi saw that the horses were charging directly at them. Their bows were notched, swords drawn, and polearms aimed towards them. 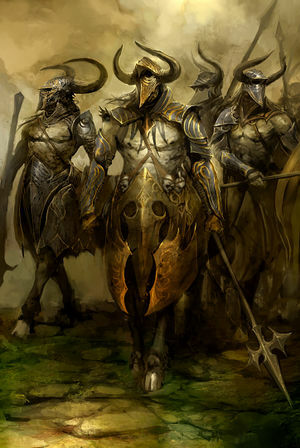 The front centaurs had large shields and were armored with protective plating and chainmail. Adlin raised his hands in the air and walked forward in submitting. "I suggest you do likewise," he said in almost whisper, barely-voiced. Madi's first urge was to prepare her fireball power. Easing back her instinct, Madi knew they had to give themselves up. There was nowhere that they could run or escape. They had to meet the centaurs one way or another. The centaurs slowed as they approached the two towards the top of the hill, now becoming cautious. A loud call shouting one unrecognizable word from one of them caused the troop to split, now beginning to circle them. She watched as the centaurs slowly trotted around them, weapons pointed directly at them. She watched them come to a join at the other end. Probably twenty centaurs in all. Another loud command shouted and they stopped. It was strange to see the horse form people stop and not hear the horse sounds and see the horse head shaking that she was accustomed to. Instead she heard panting and saw the centaurs wiping their brow. Similar to horses however, a few moved there legs and hooves just as horses do, also whipping there tails around. "You are trespassing on ekouinmanus territory." said one. Madi turned towards the voice. A plate armored mare (cm. marko) colored green and browns almost in a camouflage pattern spoke. She was colored brown and white, which helped to blend with the green and brown pattern. If seen at a distance alone, she would be difficult to see. "We are representatives of the manus territory," said Andelin in a calm voice. Madi added, " We come with peaceful intentions. We have a common foe." At that, Madi saw her look her and then look slowly off into the distant barren mountains. She then looked back towards Madi with eyes piercing it felt into her soul. She then turned to Andelin. Andelin was nodding, "Yes, we've come to aid each other. The kingdom of man has been plagued by the scorpion people just as much as you probably have been - if the stories are true." "I'll admit that there is no love between us and the plateau dwellers," the centaur warrrior said back pointing her head towards that rugged terrain. "But what proof do we have of the human's intentions. Human's enslave the horses we keep free." Andelin spoke first. "I'll admit that we are envious of your natural size and running ability. We do not have your ability naturally. So we must ride the horses gain that ability." "You tie them up," she accused them looking at them both quickly. "Horses are valuable," he said. "You imprison them within fences." "Free," she even more loud. No one spoke for a moment. Madi looked at Andelin, who also looked at her. He was wrinkling his brow and biting his lower lip. Madi noticed her extremely dry mouth. She wet her lips and tried to swallow painfully. Despite being soaked, her mouth was dry like a desert. "What can we do to show you or good intentions," Andelin managed to say. "It's not my decision," she shouted back. She now was wrestles moving side to side, her lips firmly together after speaking. "You are my prisoner now. It's for the clan chief to decide," she said, now beginning to move towards where the centaurs had come from. "Take their gear and weapons," she shouted without looking at them. "And then bring them." A soldier came towards her. Another went towards Andelin. She handed over her staff towards him handle first. She also handled over her pack. The centaur soldier after handing it off to another centaur behind him, lowered down to her level going down onto it's knees. "Checking for anything hidden, " he said. She raised her arms, and he searched everywhere for anything hidden. "Remove your ring," he demanded. She removed her glowing blue aura silver ring - the family heirloom which has great transformational powers. After placing it into her brown pouch, she placed it into the hand of the awaiting centaur. "Oh. And as for any powers," he said. "This area is guarded by the guardian totems. Any use of magic will result in a unpleasant experience for you. Magic here is only for the blessed," he said, now smiling. He stood back up. He then grabbed her around the waist and placed her behind him on his horse back. And then off they galloped to the center of the troop of centaurs.